Rising early on the Thursday morning of Easter weekend, it was time for documentation, scrutineering, final car preparation, sticking stickers, discussions with service crews, and a whole host of matters which definitely did not include rest. 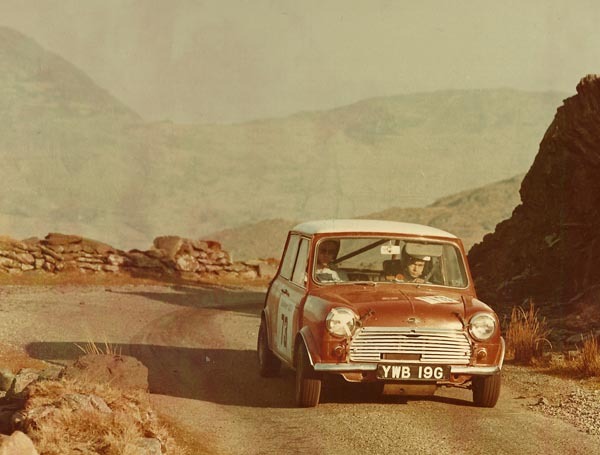 I was driving an almost standard 1275cc Mini Cooper S, along with Welsh co-driver John Morgan. At the time there was a famous co-driver of that name, so I seemed to spend my life saying “no, not that John Morgan.” But no complaints, the lesser-known one worked out just fine. We had a two car entry, the other one being an ex-works Renault Alpine A110; and we had two service crews. Unfortunately, there was a big time gap between the two competing cars, so effectively we had only one service crew each. For a while, at least. The rally started in Belfast at 10pm on the Thursday evening, taking us around the whole island, ending back in Belfast on Tuesday morning. I have no idea now how many special stages there were, but rattling a few brain cells, I’d say somewhere between 80 and 120. Many were long, all were what the Irish amusingly call “tarmac”, they were all narrow and twisty, and generally damned hard work. We had no pace notes, so what information a driver did receive was either from a map, the road book, or from prior experience. As I say, the roads were paved, but felt like they’d been laid across plowed fields, without being flattened first. Every part of the body received a good and constant shaking. The road sections were timed such that flat out driving was needed everywhere, and the whole event had a maximum lateness of just fifteen minutes. That meant arriving at any control 16 minutes after your due time, anywhere on the event at any time during the six days, and you would be excluded. Luckily the Gardaí were avid rally fans and they actively encouraged us to drive as fast as possible on the public roads linking the special stages. For an amateur crew like us, there was really only one objective – stay on the island and arrive at the finish. Maybe that’s two objectives, but let’s not get picky, we’ve only just started. So we rallied through Thursday night and all through Friday, by-passing Dublin, going somewhere near Wexford and Cork, continuing through Friday night and arriving in the rural town of Killarney on Saturday afternoon. If you’re paying attention, you’ll realize that’s just about two whole days and nights, without sleep. 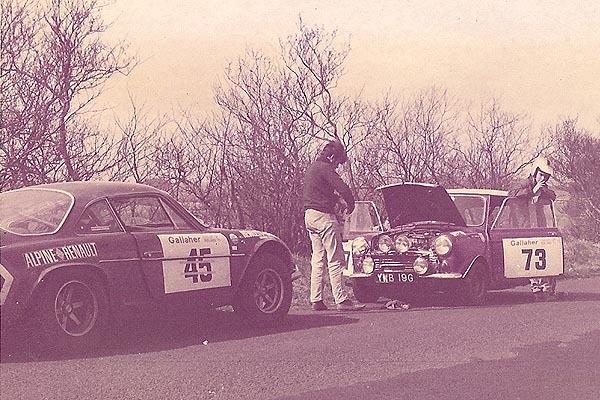 The only breaks, like most rallies in those days being for food, drink, car repairs, and perhaps a twenty minute kip. And we were only half way. Despite the fatigue, boys would be boys, and Ireland would be Ireland, so large quantities of draft Guinness would be consumed before anyone dared to fall into bed. Not that we were there long, because the rally restarted Sunday morning at 5am. Running as car number 72, we were allowed a lie in and didn’t start until the late morning time of 6:13am! At that time of the morning at that time of the year there was frost everywhere. And we were headed up into the mountains of southern Ireland, so patches of ice could be expected. No matter. For me, this was the best day of all. Absolutely classic stages such as Molls Gap and the Tim Healy Pass, in bright sunshine, all ending back in Killarney late afternoon. What? Another night in a bed? Such luxury. Must be time for more Guinness. Another frosty and foggy start at 6am Monday saw us travelling northwards up the west coast, eventually going through Monday night, heading back eastwards towards Belfast. Although we were still running, we’d had an eventful rally that almost ended on the first SS. One thing that had been overlooked was the bedding-in of new competition brake pads. So, arriving at the first corner, and most corners of that stage, I found I had almost no brakes. As a result, the handbrake and gears were well used. We located our service crew somewhere around midnight, and they were bemused (actually, rather pissed-off) to find me screaming “no brakes, no brakes.” Nothing could be done, and soon after that they started working. The next drama was the retirement of our second car on SS6. I really can’t remember why, but thankfully the car was fixed, and for the rest of the rally they effectively became another service crew. Also, I was able to co-opt their service crew, which made life much easier as there was then someone at the end of every stage. Must have been the only rally crew to have an ex-works Renault Alpine as a Service Barge! And it put a smile on my face to discover we’d beaten the Alpine on the four stages where we had working brakes, and by the time we’d reached Killarney were lying round about 20th overall. This was out of 180 entries, so it deserved even more Guinness. Our next problem occurred on Sunday, when the gear linkage worked loose, making gear selection something of a lottery. Yes, we had service crews, but don’t forget we only had a matter of a few minutes after each stage. The quick solution involved removing the sump guard, tightening up the linkage, and continuing sans guard. That wasn’t so bad. The guards were steel in those days, so without it, the car was lighter, performed better, and the front-end was higher off the ground. So, rather than risk more time delays, we left it off for the rest of the rally. And I didn’t hit anything. Then, sometime during Monday I managed to break the accelerator pedal, leaving just a stubby bit of metal. This made driving interesting, and also wore a hole through my shoe! At some point a replacement appeared and was fitted. I didn’t dare ask where it had been found, but I suspect that day an Irish Mini owner found himself wondering if – with only two pedals – someone had changed his car to automatic! As so often happens, the main drama was close to the end of the event. 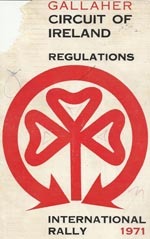 Before daybreak on Tuesday there was a so-called rest halt. Just long enough for ablutions and food. It’s impossible to describe the fatigue and exhaustion after competing for so many days. Most people had dazed looks, and barely recognized each other. I remember seeing one female co-driver wandering out of the men’s room, I think not having any idea where she’d just been. Feeling at least slightly refreshed, I went off to find my co-driver, and to set about completing the half dozen stages of the rest of the night and morning. Unfortunately I found him in the rally car, fast asleep. And when I say fast asleep, I mean so gone that I couldn’t wake him. The big problem was that he had no control over his head while being effectively unconscious. I’d stuck his helmet on, which just made his head heavier. So, on every bend, I thought he’d break his neck. After only a few corners, I realized the only solution was for me to keep one hand on top of his helmet. That made changing gear a problem, so I tried not to, unless really necessary. And so we continued, until somewhere outside Belfast he woke up… thinking we were just leaving the early morning rest halt. Whereas he’d been out cold for about four hours. No matter. We finished. Where? I didn’t really care, but somewhere around 41st, 42nd-ish. It was lunchtime. Time for Guinness. And then I crashed, until next morning. I’m told I was at the celebration dinner, but if I was, I wasn’t awake. Once the exhaustion from this type of event wears off, there is immense satisfaction from having completed it. The results really didn’t matter, unless you were in a works team and were expected to finish in the top five. It would be the same if I’d ever climbed Everest. I wouldn’t worry about the number of days it had taken. So, then we all went home, and Belfast was returned to “The Troubles.” The IRA must have been rally fans because they thoughtfully issued a cease-fire for the days of the event; and then the day after they blew-up the hotel which had housed the Rally HQ and most competitors. What a week!